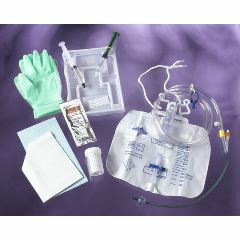 Each of the following Foley trays contains: compartmentalized prep tray, wrapped gloves, 3 pre-saturated PVP swabsticks, 2 dry swabsticks, moisture-proof under pad, fenestrated drape, 10 cc syringe pre-filled with sterile water, water soluble lube jelly, specimen container with ID label, junction seal, CSR wrap. 16Fr 5cc anti-reflux device. They work well for mother. She is prone to UTIs and so far urine looks good.